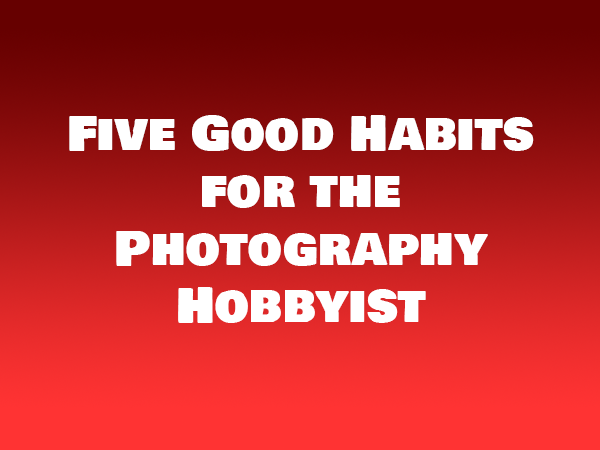 When your day job comes between you and the enjoyment of shooting pictures during the week it is important to form good habits when you pack your camera and take it out for another shoot. How many times have you seen something that made you reach for your camera to take a quick picture when your camera has been packed away for a few days? Maybe it is a family moment. Maybe it is a rainbow after a light rain. Maybe it is just a whim when you are in the middle of doing something else. Whatever the inspiration, you reach for the camera quickly and your mind tells your finger to “shoot it or lose it.” So you snap the shutter first and check the settings later only to see that you are at ISO 1600 or that your white balance is set to cloudy. There is a simple routine to follow that will make every picture count. Here are five things to do every time you put the camera back in your bag at the end of each shoot and every time you take it out. Check the mode. I like to leave my camera in Aperture priority mode at f.8 so I know that if I pick it up to shoot something quickly I can just snap the shutter and get the shot. Check the ISO. I keep the ISO set at 100 and I only change it when I am shooting in low light without a flash or when the ambient light takes my shutter speed below an acceptable speed for a hand held shot and I don’t have my tripod. Check the exposure compensation button to be sure it is set to 0. I hate this option and much prefer manual mode over anything else, but cameras have it and people use it. Check the Bracket button. If you like HDR then you will often set the camera to bracket your exposures. It is very important to turn the bracketing off before you turn the camera off or you are likely to forget that your last session was bracketed. Check the white balance. I make sure that the last thing I do before I press the shutter for the first time in a shoot is to look at the white balance setting and be sure it is on Auto. However, next to ISO most hobby photographers presume they are always set on auto white balance.